Click here for an alphabetical list of surnames located in this book. 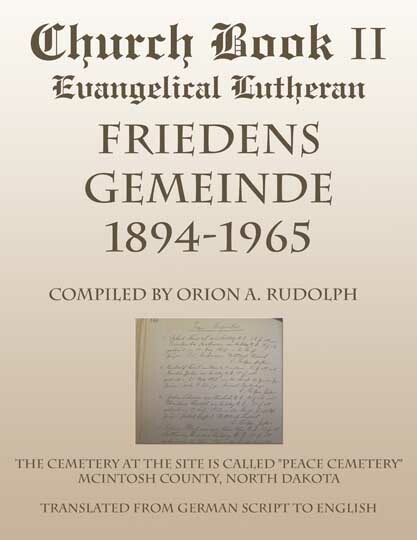 Church Book II: Evangelical Lutheran Friedens Gemeinde 1894-1965 is a translation of the original church record book from the Friedens Church. The German script was translated by Dorothea (Bergstedt) Ziegler – Dickinson, ND and typed by Orion A. Rudolph – Ashley, ND. The Friedens Church is one of seventeen Evangelical Lutheran Congregations churches in McIntosh County, North Dakota. These rural congregations are now associated with Zion Lutheran Church, Ashley. The Friedens Gemeinde church book contains baptismal registers, meeting minutes, communion registers, death registers, offerings, member registers, marriages, and burials. As a special enhancement for the book, Rudolph photographed all the tombstones at Peace Lutheran Cemetery. Rudolph also compiled all dates and had the inscriptions translated. Orion A. Rudolph writes, "It was in the year 2001 when my interest was triggered in this old church record book. My wife and I were called one evening by a church centennial committee person and asked if we could possibly write a paragraph of the Hoffnungs (Hope) Lutheran Church, its beginning and ending for the 2003 Zion Lutheran Centennial Book. Also that my wife’s name is listed in it as being the last one baptized there before the church closed. We thought that might be a nice thing to do. Upon looking through this book, we both knew it was next to impossible to write anything. It was at least 90% in the old German script. A problem indeed was at hand. It took us several months to find someone to write the paragraph that was requested." "I kept thinking, how about the future generations, and say 25 to 50 years or more from today?" "With this question to be answered, it meant I better get busy quickly and try my best to get this German church book translated. But who would help with that endeavor. After several more months of searching for someone that I felt was very confident and could do a good job for me. I knew I could do all the typing once it is translated, but getting it translated was the problem. A local lady, Mrs. Leona Neu knew I was looking for someone that could help me. One day she handed me a telephone number and said, "You call this person, I believe she will be able to help with your endeavor." I made that phone call, a lady answered, I told her who I was, who gave me her phone number, where I was calling from and what I am trying to accomplish etc. Her first remarks were, "Do you recognize anybody’s name on some of the pages." I said, yes. There are a lot of pages that I thought were minutes of meetings and a signature on the bottom of some, signed D. Bergstedt. She chuckled a bit and said, "That was my dad." We lived in the Ashley area during 1922-1933. He preached in quite a few other churches around there too. I attended country grade school east of Ashley. What he wrote in that book I know I can read that script and tell you what it is. She said, "I would be very happy to help you on this kind of project to translate this old church record book." So after a lengthy conversation of getting acquainted, I told her I would start with by copying about 20 pages from the old book and mail them to her. A week later I received the copied pages and her translations of each page back from her. 'Very nice hand writing too.' So this process of sending 20 some pages at a time kept on until the entire book was all translated and typed." Orion A. Rudolph was born in June 1938 at the family farmstead eight miles northwest of Fredonia, North Dakota. He attended country school one mile from the farmstead in grades one through four. He attended grades five through eight at Fredonia city grade school, and also attended Kulm High School, Kulm, North Dakota. Rudolph served in the United States Navy for four years, and after being discharged from the navy in 1963, he married his high school sweetheart. They set up their home in Aberdeen, South Dakota. During this time, Orion and his wife, Delores, raised two girls. Rudolph worked for a trucking firm doing office work until 1969, when he began attending Northern State University in Aberdeen for four years, graduating in 1973. Following his graduation, Rudolph and his wife moved to Ashley, North Dakota where he worked at an implement parts store for 19 years. It was in the year of 1985 when tragedy struck the Rudolph family. Their oldest daughter was killed at 19 years of age in a tourist helicopter crash at Keystone, SD during a return air flight around Mount Rushmore. The GRHC published Church Book I: Evangelical Lutheran Hoffnungs Gemeinde 1904-1944 earlier this year. Rudolph also compiled two family histories: Rudolf Rudolph, Descendants of Johann Georg Rudolf and Hoffmann-Hoffman, Descendants of Johann Georg Hoffmann. These family histories are both catalogued in the GRHC archives. When asked why he got involved with this large project, Rudolph said, "Spiritual drive...the more I got involved, and with Dorothea's encouragement, the more spiritual drive I had for this project." He wants the books to be accessible in the English language so future English speaking generations can read these books. Dorothea Ziegler nee Bergstedt grew up in the German-Russian community of Ashley, North Dakota. Her father, the Rev. Diedrich Bergstedt came directly from Germany, while her mother was an American-born German who could speak both German and English. She said, "My dad taught me very good phonics. We spoke German at home all the time. I was through the eight grade and we hardly talked anything in English." Ziegler’s dad, a Lutheran Pastor, had parishes in the area east of Ashley, and also Dunn Center and Dodge, North Dakota. Her dad was the pastor in this east of Ashley area during the time period 1922-1933. The little churches in this area are all dissolved. She attended country grade school just a mile south of the country parsonage where the parents lived. After she finished the eighth grade she went to Fargo, North Dakota to attend high school there. She attended two years of Bible school in Fargo. Then two years of nurses training school. She practiced nursing for 23 years at Fargo and Dickinson, North Dakota and Waterloo, Iowa. In addition to the nursing profession, she was also a professional wife, mother, and homemaker. She also transcribes German language into English which she enjoys doing. Click here to see an article about Dorothea Ziegler in the Dickinson Press.